It's rare, but from time to time, two greats become connected, even if for just a brief moment. From then on, their names together resonate as a fated pairing and are forever recognizable to generations as something special. 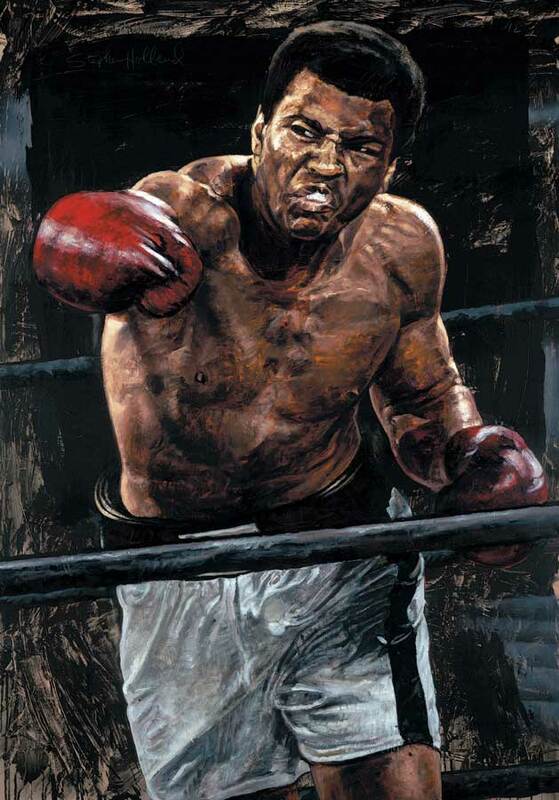 In the world of art and sports, Stephen Holland and Muhammad Ali are two such names. Nearly two decades ago the most famous living athlete (if not person) on the planet and a painter who soon would become known as the leading artist of sports, came together to produce a single painting. The uniting of these two champions - of their respective disciplines would be the beginning of a long legacy of art work. This work is coveted by collectors far and wide and supports a special friendship as well. Stephen Holland, of course, has made an unparalleled reputation for himself as an artist of popular culture. He has painted one by one all the greats. Despite the endless list from World Cup to Grammy winners, it is his powerful works of Muhammad Ali that remain his most noted.